I’m currently working on my MAJS from Hebrew College in Boston, through a distance learning program. I have to attend two classes in Boston at some point (typically a one week summer session), but everything else is done “online”. The school formerly used “Blackboard“, which is one of the larger learning management systems (LMS) in the playing arena. Many schools choose Moodle over Blackboard because it is “open source”, i.e. the tool can be installed and operated for free, if you have the Information Technology (IT) staff to deal with it. I’m sure one of the hardest things for a school to do is to estimate the volume, i.e. how much disk space they will need, how many times the students will access the system, and how much staff they will need to support it. Schoology defines themselves as follows: Schoology provides an enterprise level learning management system and configurable social network. 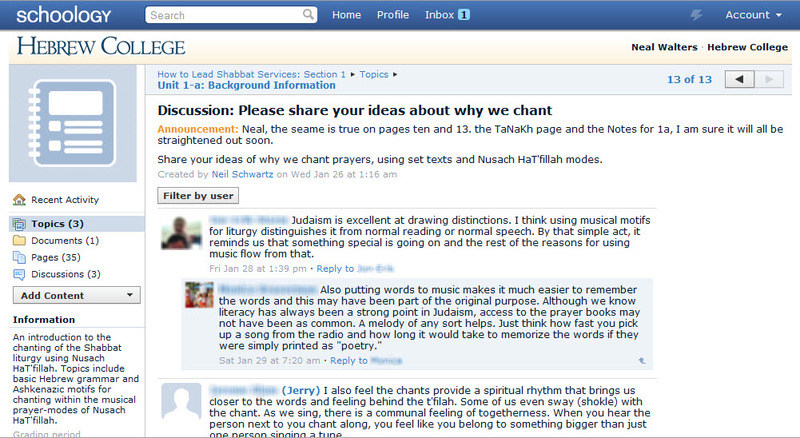 Instructors and students can easily create, share, and manage academic material through a social networking interface. By incorporating learning management tools into a social environment, Schoology provides a means for teachers, students, parents, and administrators to seamlessly communicate and collaborate on academic issues. Schoology is “cloud based”, i.e. you don’t run it on your own server, but on their servers. They apparently allow you to get started for free, but it’s unclear how much you really get for free. The Schoology.com features page shows numerous free features, but then says: “Schools and districts can purchase premium add-ons to customize the system. These add-ons include system customization options, support packages, training & professional development, integration, and storage.”. Similarly, their API (application programming interface page) says: “The API will be free for anyone to use with the option to upgrade for enterprise level access.”. After using Blackboard now for about 4 years, I saw absolutely zero enhancements over that period. I’m not saying Blackboard didn’t make any enhancements, but at least my school didn’t implement or pay for any of them. Thus, our use of Blackboard was starting to look like a system from 5 to 10 years ago. As a developer, I can tell that Schoology uses “Ajax” and some very modern user-controls (i.e. when you click a button, the web page often changes by going to fetch data from the website). This is generally very cool; however, I have noticed when I click the “back” key, a page can take a long time to load, because the data is being re-retrieved by the controls (as compared to a normal web page, where the entire page is cached on your local machine, and thus it appears in the browser much more quickly). Overall I applaud Hebrew College’s decision to move to Schoology and I look forward to using it more, and will keep it in mind to replace some on my older Moodle sites as well.